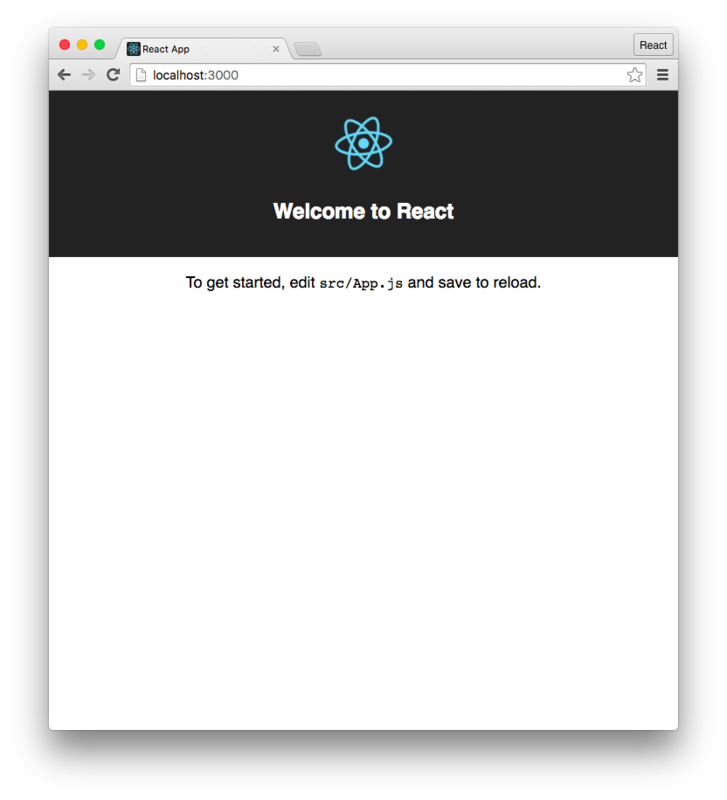 In this post, we detail how to use the create-react-app project along with an API server. Update (8/3/2016): We now have a mirror for this post that uses Rails. Check out that post if Rails is your preferred API server platform. Update (8/25/2016): react-scripts version 0.2.3 was released, adding a proxy feature for the Webpack development server to address CORS issues in development. This post has been updated to utilize this feature. Update (11/21/2016): We updated the repository to be cross-platform (Mac/Unix/Windows). Update (2/8/2017): Tested and working on latest version of react-scripts. However, if you&apos;re like most developers, you will be quickly lured away from these tranquil waters. JSX, ES6, ES6 modules, hot reloading — pick your bait. While there are discrete steps you can take to enable individual advantages, you&apos;ll hit limitations with each sooner or later. For example, you can load babel in script tags and get JSX and ES6. But you&apos;ll start running into problems when you want to break up your app across files and use the ES6 module pattern or roll out browser-less unit tests. There are loads of boilerplates and libraries to help you get started with a more advanced React setup. But the Facebook team recognized that as long as there wasn&apos;t a core-team sanctioned solution, the community was likely to remain splintered. The first steps for a more complex React setup can be confusing for novice and experienced developers alike. The create-react-app project aims to provide a canonical manner for initiating a new React app for those that want the benefits of a more complex setup but don&apos;t want to deal with the configuration. In this post, we&apos;ll explore using create-react-app alongside a Node+Express API server. If you&apos;re interested in learning the ins and outs of React, our book fullstackreact.com starts at the ground floor and sprawls out to cover advanced techniques and other tools in the React ecosystem. Many of the shell commands below are for Mac/*nix. But the code itself has been fully tested on Windows. Our sample app will be a simple food nutrition lookup table. The data driving the app is supplied by the USDA&apos;s National Nutrient Database. We&apos;ll take a look at the working app first. Then we&apos;ll strip down the app to just the Node+Express server and build it back up by adding in our React app. This is where the server lives (aptly, server.js). Inside of the db folder is a sqlite database containing the nutrition data. The package.json in this folder specifies the dependencies for the server. Of interest, we have two package.json files in this project — one here and one up top. The client and the server specify their own dependencies independently. For all intents and purposes, they are two completely separate apps that could exist in their own discrete git repos. $ npm i && cd client && npm i && cd .. The && operator is Mac/Unix specific. This removes the files inside client/. We&apos;re only booting up the server as we don&apos;t have the client yet. This server provides a single API endpoint, /api/food. It expects a single parameter, q, the food we are searching for. Mmm, Chick-fil-A. Really hope you&apos;re not reading this on a Sunday. Now that we understand how this endpoint works, let&apos;s build the front-end application. Kill the server with CTRL+C. Like Babel, ESLint, and Webpack. Config files for Webpack, Babel and ESLint, both for development and production. For instance, the command react-scripts start runs a script shipped with this package. It&apos;s responsible for ultimately booting the Webpack development server. We have our API server in the top-level directory and we were able to boot that. And we have our client app down here in client and we&apos;re able to boot a server for this. But why does our React app need its own server? And how are we going to get these two servers working together? Understanding this requires getting down to The Rub. This command kicks off Webpack and Webpack spits out a bundle. You could then serve the index.html from that bundle wherever you&apos;d like. So, we could use Webpack to generate this bundle. And we could have our API server serve the static asset index.html. We&apos;d run the build command inside client/ and out would come the magic build folder. We could then serve this folder with our API server. And it would work. And we might even be happy about it. In fact, if you run npm run build you&apos;ll find that this command is intended for production use. It does all kinds of optimization that can be time consuming — aggravating when you&apos;re quickly iterating in development. Booting a Webpack dev server is the way to go. In production, we&apos;ll use npm run build to create our static bundle. We can then throw that bundle anywhere (like S3), independent of the API server. The README of the GitHub repo for this project describes the process. So the user will direct their browser to localhost:3000, hitting the Webpack dev server. But then how will the React app communicate with our API server? This would produce an issue, however. The React app (hosted at localhost:3000) would be attempting to load a resource from a different origin (localhost:3001). This would be performing Cross-Origin Resource Sharing. The browser prevents these types of requests from scripts for security reasons. 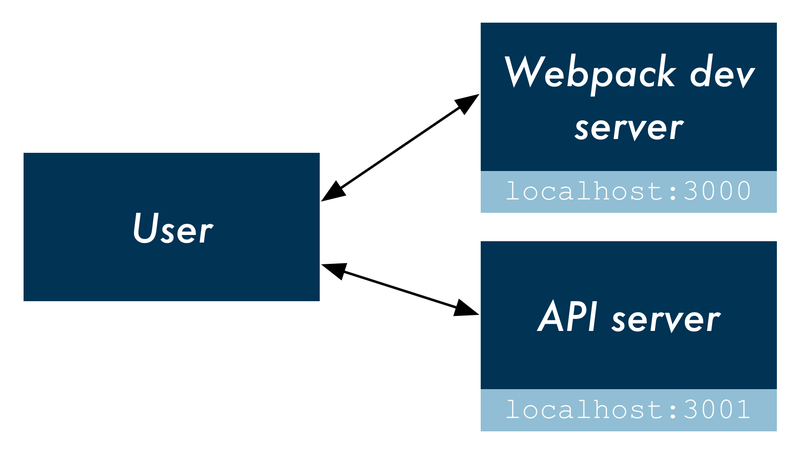 In this flow, React makes an API request to localhost:3000, the Webpack development server. And then the development server simply proxies that request to the API server, negating any CORS issues. So, the Rub: we need to (1) launch both the Webpack dev server and the API server in order to run the app locally. And then (2) we need to get the Webpack dev server to proxy requests intended for our API server. For the first challenge, we could use two terminal windows: boot each server in its own window. But we could get a bit fancier. Concurrently is a utility for running multiple processes. We&apos;ll see how it works by implementing it. $ concurrently "npm run server" "cd client && npm start"
Note the second command for booting the client first changes into the client directory and then runs npm start. However, the && operator is not cross-platform (doesn&apos;t work on Windows). As such, we&apos;ve included a start-client.js script with the project. This script will boot the client from the top-level directory in a manner that is cross-platform. $ concurrently "npm run server" "npm run client"
For start, we execute both commands, escaping the quotes because we&apos;re in a JSON file. For client, we execute the start-client.js script with node. Now we can boot both servers by running npm start. With the foundations in place, let&apos;s wire the two up. We&apos;ll toss in the food lookup React components which will make requests against our API server. We use Semantic UI for styling the app, which we copy over as well. It&apos;s loaded inside of src/index.js. index.css contains a few kludgey margins. For brevity, we won&apos;t walk through the React components. For the purposes of reading along, you just need to know that changing the value of the search bar (the FoodSearch component) ultimately calls search() on Client. This is the one touch point between our React web app and the API server. Notice how the URL does not include the base localhost:3001. That&apos;s because, as noted earlier, we want this request to be made to the Webpack development server. Thanks to the configuration established by create-react-app, the Webpack dev server will infer what traffic to proxy. It will proxy a request if the URL is not recognized or if the request is not loading static assets (like HTML/CSS/JS). We just need to instruct Webpack to use the proxy. 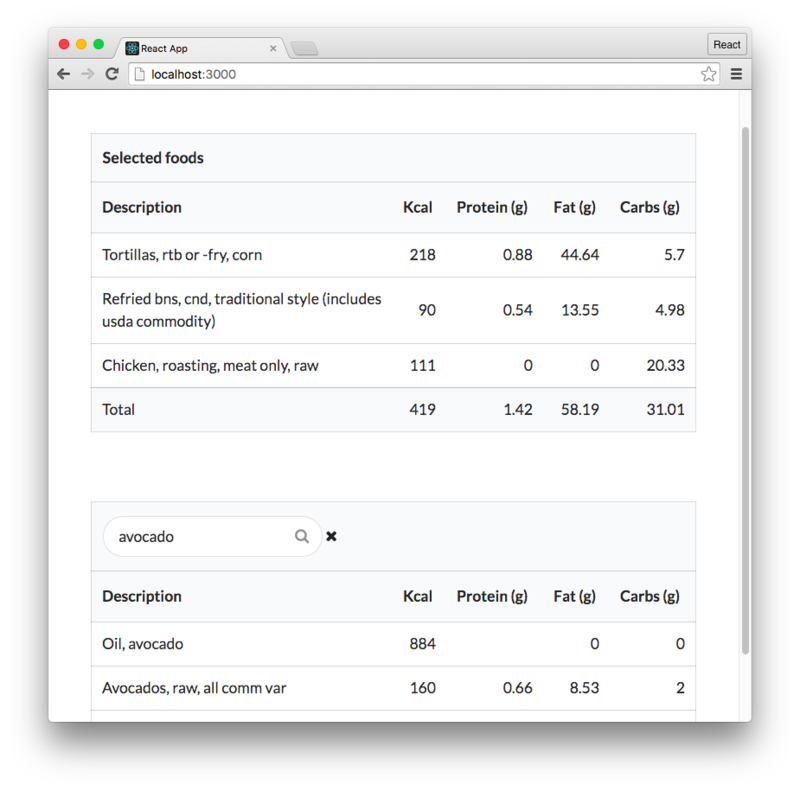 If you&apos;re not coding along at home and want to take a peek at FoodSearch.js, just check it out over on GitHub. Our React app is ready and in place in client/. We have concurrently setup to boot both our Webpack dev server and our API server together. And we&apos;ve specified the route that Webpack should proxy API traffic to. When using Webpack/create-react-app, you have a few options for deployment. You can upload this folder to a host like S3 and deploy your app to AWS. Or, you can have the API server also serve your static assets. The GitHub repo of this app contains an example of the app prepared for deployment. Check out the Heroku section of the README. If you liked this post and want to learn more about Webpack and create-react-app, you would love our book Fullstack React because it contains an entire chapter on the topic.